McGill-Queen's University Press. PAPERBACK. 0773516417 New Condition. . New. McGill-Queen's University Press. PAPERBACK. 0773516417 Like New Condition. . Fine. Mcgill Queens Univ Pr, 1997-05-01. Paperback. Used:Good. Mcgill Queens Univ Pr, 1997-05. Paperback. Good. McGill-Queen's University Press. Used - Very Good. Ships from Reno, NV. Great condition for a used book! Minimal wear. 100% Money Back Guarantee. Shipped to over one million happy customers. Your purchase benefits world literacy! McGill-Queen's University Press. Used - Good. Former Library book. Shows some signs of wear, and may have some markings on the inside. (McGill-Queen's University Press, 1997). Paperback. Very good. xiv + 247pp. McGill-Queen's University Press, 1997. Paperback. Very Good. Couverture Souple, Texte Francais. État D'usage: Très Bon État. 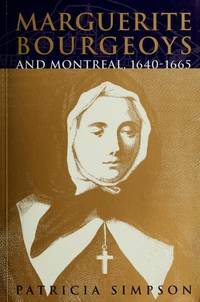 (French Edition) Born And Raised In Troyes, France, In 1653 Marguerite Bourgeoys Came As A New Recruit To De Maisonneuve's Tiny And Beleaguered Settlement Of Ville-Marie, Founded In 1642 As A Christian Missionary Society. These Early Years In New France Marked A Special Period In Her Life. Firmly Committed To The Belief That The World Would Be A Better Place If People Learned To Understand One Another, She Worked To Build A Better Church And A Better Society, Especially For Women And Children. Marguerite Bourgeoys's Life Story Teaches Us About Tolerance And Compassion, Ideals That Are No Less Important Now Than Three Centuries Ago. Ithaca, New York, U.S.A.: McGill Queens Univ Pr, 1997. Hardcover. Very Good/Very Good. 8vo - over 7¾" - 9¾" tall. Jacket protected in mylar. pages clean, binding tight. McGill-Queen's University Press. Paperback. 0773516417 . Good. 1997. McGill-Queen's University Press, 1997. Hardcover. Very Good. Disclaimer:A copy that has been read, but remains in excellent condition. Pages are intact and are not marred by notes or highlighting, but may contain a neat previous owner name. The spine remains undamaged. The dust jacket is missing. At ThriftBooks, our motto is: Read More, Spend Less. MONTREAL, CANADA: MCGILL -QUEEN'S UNIVERSITY PRESS, 1998. PAPERBACK. FINE. McGill-Queens University Press, 06/01/1997. Hardcover. Used; Good. **WE SHIP WITHIN 24 HRS FROM LONDON, UK, 98% OF OUR ORDERS ARE RECEIVED WITHIN 7-10 DAYS. We believe you will be completely satisfied with our quick and reliable service. All orders are dispatched as swiftly as possible! Buy with confidence!